Once again, the Lake Oswego Public Library is ahead of the curve. 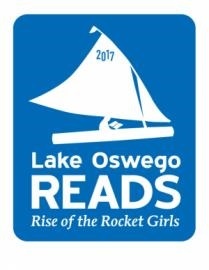 Before Hidden Figures—a movie about three African American women scientists whose mathematical prowess helped NASA launch its first successful space missions—was released last month, the Lake Oswego Public Library had already selected Rise of the Rocket Girls as its 2017 featured book for its award winning citywide reading program. Bringing the contributions of female mathematicians to NASA’s success to light, the book promises to fill in a gap that exists in most Americans’ versions of history. While most of the Lake Oswego Reads activities begin in February, the program kicks off this week with its annual book giveaway on Tuesday, January 9, from 6:30 p.m. to 7:30 p.m. Enjoy popcorn and Tang and receive a free copy of the book with your LO Public Library card. Free Ticket Giveaway to hear author, Nathalia Holt, speak on February 8 at Lake Oswego High School. Show up with your library card and receive two admission tickets free of charge. Get there early as a line forms. Saturday, January 14 at 11:00 a.m. Lake Oswego Public Library, 706 Fourth Street. 503. 675.2538. Women in Space. What do Sally Ride, Peggy Whitson and Pamela Melroy have in common? They are just a few of the women who have contributed to the NASA space shuttle program. Learn more from NASA enthusiast, Dave Suing on Thursday, February 9 from 7:00 p.m. to 8:30 p.m. at The Springs Living at Carman Oaks, 3800 Carman Drive. Breaking the Sound Barrier: Celebrating Unsung Heroes in Science. Who says you have to learn everything from a book? Let Reader’s Theatre introduce you to women of achievement in science that you’ve probably never heard of, drawing from an impressive list of Nobel Prize winners, inventors and astronauts. Saturday, February 11 from 10:30 a.m. to 12:00 noon at the Lakewood Center for the Arts-lower level – 368 S. State Street. Rocket Launch Demonstration. If you can’t get to Cape Canaveral, head over to Palisades School for Oregon Rocketry’s rocket launch demonstration. If you’re more the do-it-yourself variety, launch pads and controllers will be available to those who want to fly their own rockets as long as they have A and B motors only. Saturday, February 11 from 11:00 a.m. to 1:00 p.m. 1500 Greentree. 50s Dance and Demonstration. Step back in time as you watch how it’s done from the Madison, and Stroll to the Hand Jive and Cha-Cha. Saturday, February 18 from 6:00 p.m. to 9:00 p.m at Step It Up Studios, 449 Third Street. Trivia Night. Test your 50s IQ with questions ranging from math and science to food and fashion. Tuesday, February 21 from 7:00 p.m. to 8:30 p.m. at the Lake Theater and Cafe, 106 N. State Street. Living in Space: How to Pee, Poop and Barf. This is Lake Oswego’s version of “Everything you wanted to know about how astronauts live in space but didn’t know who to ask.” Enter Marylhurst Associate Professor of Science and Interdisciplinary Studies, Dr. Jan Dabrowski with the answers. Thursday, February 23 from 7:00 p.m. to 8:30 p.m. in Flavia Hall Salon, 17600 Pacific Highway. Women in Aviation Program for 5th through 8th grade girls. Hilda Pereyo from Evergreen Aviation will inspire your young ones with stories of key mentors and pioneers in the aviation and aerospace industries. Monday, February 27 from 5:00 p.m. to 6:00 p.m. Limited space so please register: 503.675.2538. For further information on Lake Oswego Reads, call Cyndie Glazer at 503.675.2538. Don’t miss out on what’s going on in Lake Oswego. Click the “Sign me up” button in the top right hand column and subscribe to my blog for weekly updates. This entry was posted in Lake Oswego Library and tagged Lake Oswego Oregon, Lake Oswego Reads, Rise of the Rocket Girls. Bookmark the permalink.